Following the film, get a taste of the Beatles' iconic flare with a live performance by the incredible Cavern Club Beatles the first and only resident band endorsed by the Cavern Club. Vantage, DB11 and the DBS. Bentley’s Bentayga, Mulsanne, Flying Spur and GT/GTC. From McLaren we have 570 GT and Spider. The 600LT, 720S and the incredible brand new model, Senna. No British car rally would be the same without the Rolls Royce and we have the Dawn, the Wraith, the Cullinan and of course the Phantom. Having driven around Beverly Hills in the morning the cars will park at the end of Crescent and in the forecourt of the Wallis Annenberg Center for the Performing Arts at 11:00am in order for the public to view them. This will be a wonderful chance to view some of these incredible million dollar cars. It is an event not to be missed. The Rally will be followed by a special screening of the iconic The Italian Job at 2pm at the Wallis Annenberg Center for the Performing Arts, supported by BAFTA LA. Hosted by Megan Phillips and Nigel Daly. NewFilmmakers Los Angeles (NFMLA) once again presents a slate of films from the United Kingdom with InFocus: UK Cinema, along with a mixture of local, domestic and international stories and a debut feature film. The celebration kicks off with a shorts program for InFocus: UK Cinema, offering a mixture of genres from across the UK, including animation, comedy, horror, drama and Sundance selected short documentary Life in Miniature. The evening continues with Desert Shores, the feature film debut of Michael Stevantoni, which offers a contemplative exploration of marriage and masculinity through the lens of one man’s decision surrounding a promotion that would require his family to move, based on George McCormick’s short story collection Salton Sea. The final shorts program of the night, Place We Find Ourselves puts a lens on stories of places and becoming absorbed in them, both tangible and intangible, evocatively familiar and entirely new. Los Angeles-based British sculptor Thomas Houseago's approach to the human form combines traditional and unconventional materials to create bulky figures rather than graceful classical poses. His large-scale works convey the power and vulnerability of the male body. Writer-director James Gray joins Houseago to discuss the creation of male figures and characters. The centerpiece of Britweek, the Innovation Awards celebrate the very best of British and American creativity and entrepreneurial talent. At a glittering awards ceremony at the magnificent Fairmont Hotel, we will crown the 2019 winners of this special prize, which recognizes achievement on both sides of the Atlantic. Who will follow in the footsteps of the likes of Simon Cowell, Sir Lucian Grainge and Will.i.am? Find out at a gala dinner, which will tell the proud story of innovation and excellence and show, what happens when the best and brightest from two great countries come together. BritWeek is pleased to announce a continued partnership with the Getty Museum. This incredible red carpet evening will take place in conjunction with the newly reinstalled collection. Please join us. Guests are invited to take in the breathtaking ocean view, iconic architecture, and classic art during Sunset and for the first time will be able to experience a new thought provoking exhibition, combining rare antiquities and contemporary art. "Plato in Los Angeles" celebrates philosophy, the foundation of Western culture. Come experience the unveiling of new works by eleven of today's most significant artists, including Jeff Koons and Raymond Petitibon. This is a rare treat for art enthusiasts. Get your "think on" and join BritWeek and the Getty Villa where great minds think alike. This event is via invitation only. At a glittering awards ceremony at the magnificent Fairmont Hotel, we will crown the 2018 winners of this special prize, which recognises achievement on both sides of the Atlantic. Who will follow in the footsteps of the likes of Simon Cowell, Sir Lucian Grainge and will.i.am? Find out at the gala dinner which will tell the proud story of innovation and excellence and show what happens when the best and brightest from two great countries come together. BritWeek and The Wallis present A SHAKESPEARE JUBILEE! 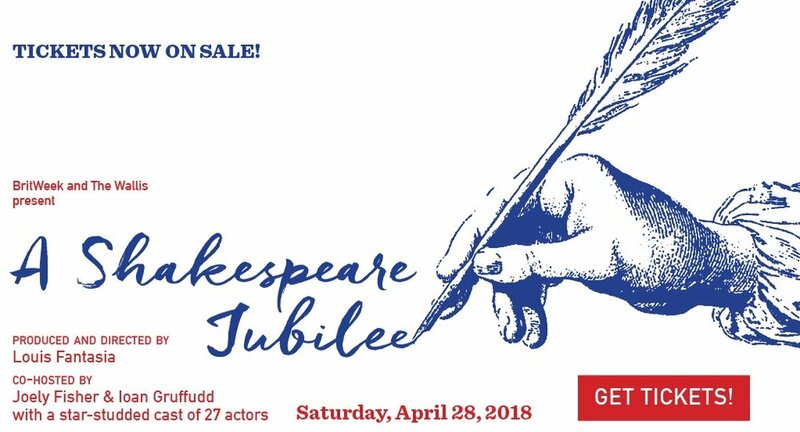 BritWeek presents a night of Shakespeare performed by some of the finest actors in Los Angeles and produced and directed by Louis Fantasia, co-Hosted by Ioan Gruffudd & Joely Fisher. A Shakespeare Jubilee!, BritWeek's first co-presentation with The Wallis. Produced and directed by Louis Fantasia, and featuring a star-studded cast of 27 actors, A Shakespeare Jubilee! takes place Saturday, April 28, 2018 at 7:30pm in the Bram Goldsmith Theater at The Wallis. It’s a rare to see not only seasoned veterans, but to compare American and British approaches to some of the most indelible passages in the English language. NewFilmmakers Los Angeles (NFMLA) celebrates BritWeek with independent cinema on April 28th with a selection of UK and local films. Featured are two BAFTA-nominated filmmakers, the debut short film from Blake Harrison, the star of the BBC show The Inbetweeners and a short by best-selling author and YouTube star Will Darbyshire. The night begins with UK feature film Let Me Go by Polly Steele, an intergenerational story about the unraveling of a family secret and its emotional impact on three mothers and three daughters. Second is InFocus: BritWeek, a collection of short films from by UK filmmakers that include stories of love, family strife, foreboding and the search for human connection. The night concludes with a narrative shorts program highlighting local Los Angeles talent and prominently features themes of finding, losing and letting go. Admittance to the Nuart Theatre screenings is free for AMPAS and ASIFA membership cardholders. Based on the 1998 book by the acclaimed British author and illustrator Raymond Briggs, this beautifully hand-drawn, animated feature film tells the true story of Raymond’s parents – Ethel and Ernest - two ordinary Londoners living through a period of extraordinary events and immense social change. Heart-warming, humorous and bittersweet, the film follows the lives of lady’s maid Ethel and milkman Ernest. From the socially stratified 1920s to the moon landing of 1969, the film depicts, through Ethel and Ernest’s eyes, the most defining moments of the 20th Century: the darkness of the Great Depression, the build up to World War II, the trials of the war years, the euphoria of VE Day and the emergence of a generation from post war austerity to the cultural enlightenment of the 1960s. The film features the voices of Academy Award Best Supporting Actor winner Jim Broadbent, Academy Award Best Actress nominee Brenda Blethyn and Olivier Award winner Luke Treadaway and introduces an original song written and performed by Sir Paul McCartney.